Frankfurt a. Main is the headquarters of Chemetall. From here all global activities of the surface treatment businesses are coordinated with the regial subsidiaries. Most of Chemetall's Upper Managment and Global Segment Managers are located in the headquarters. Frankfurt is also one of the three global R&D Centers of Excellence, including all central RD activities as well as the laboratory and analytical department. About 300 employees work in Frankfurt. Langelsheim is the largest and most diverse production location operated by the Chemetall Group. Today's production range covers chemicals for the surfact treatment of metals, inorganic and organic lithium compounds and lithium metal, aircraft sealants as well as high-purity metals and metal compounds of the elements caesium, barium, titanium and zirkonium. The Langelsheim industrial park has a workforce of around 700 employees which makes it one of the most important employers in the region. History of the plant: In 1920, Frankfurt-based Metallgesellschaft (MG) acquired the producer of zinc-oxide and lead. The so-called "Technical Department" of MG is the precursor of today's Chemetall. Based on various metal compounds, its chemists and engineers over the years developed a multitude of new products and production processes which prompted the continuous growth of the product portfolio and production facilities in Langelsheim. Production is distributed across 20 different plants of various sizes. The majority of these plants require an operating permit according to the BImschG (Federal Immission Control Act) and are bound by the Hazardous Incident Ordinance. According to current legislation, this means that the complete production site is subject to the said regulation which specifies particularly stringent requirements regarding safety and environmental impact. This includes a comprehensive safety and risk analysis, for example. This and the fact that the production site is located next to the Harz natural wildlife park and directly on the banks of the river Innerste, which was left in its natural condition, results in a situation where environmental protection and occupational safety have become top priorities for this location. In 1999, Hebro joined Chemetall GmbH, a company of Rockwood Specialties Group, Inc. This positive move for the company allowed leveraging further synergies and especially also expanding into other European countries. Today, Hebro ist represented in nearly all industrialized countries in the world either directly or via the subsidiaries of Chemetall and can thus also comply with the growing demands of its customers who are equally starting activities abroad. Since July 1, 2013 the formerly known company André Coatings is part of the Chemetall GmbH. André Coatings emerged from Anton André Sohn, in January 2003, a renowned traditional company which could look back on decades of experience in coatings development and production. The company develops and produces water-soluble or dissolved in organic solvents paint systems for the coil coating, steel, wood and plastics industries. The production processes include analytical and/or physical raw material control, mixing, homogenizing and wet grinding with automated production facilities, as well as subsequent quality control. Process data are determined, monitored and documented over a process control system throughout the entire production process. The company is certified according to DIN EN ISO 9001. 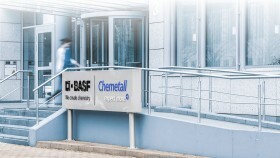 Since May 1, 2015 the formerly known company Chemal is part of the Chemetall GmbH. Founded in 1975, Chemal GmbH & Co. KG specializes in research and development of surface finishing chemicals for aluminum and its alloys with emphasis on anodizing and pretreatment technologies. With an extensive history of success, Chemal has become a reference point for the surface finishing of aluminum.